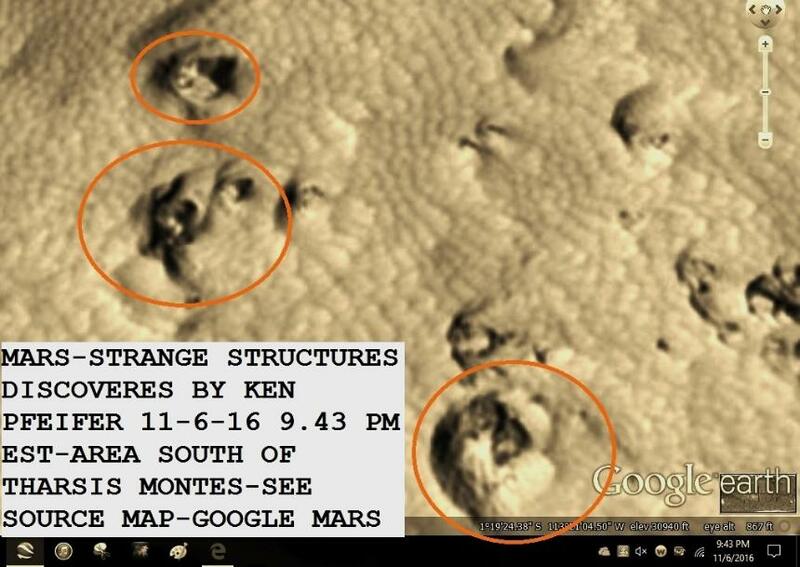 THESE IMAGES ARE FROM GOOGLE MARS AND WERE DISCOVERED BY KEN PFEIFER ON 9-12-16. THIS AREA IS WEST OF GORDII FOSSAE AND IT LOOKS LIKE A ALIEN CRAFT BASE . CRAFT ARE SEEN AT THE ENTRANCE TO CAVES ON THE MARTIAL SOIL. THE SOURCE MAP IS AT THE TOP OF THE IMAGES FOR PEOPLE WHO WANT TO LOOK FOR THEMSELVES. 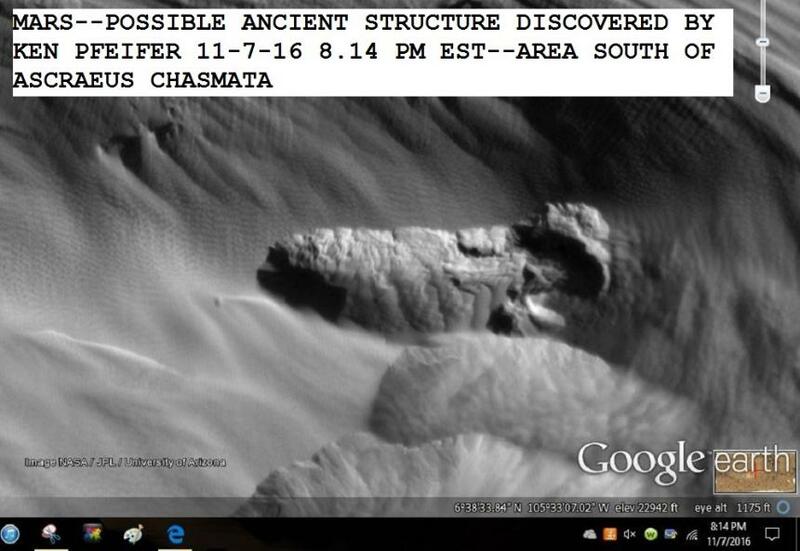 I HAVE DISCOVERED SOME STRUCTURES ON MARS IN THIS AREA 11-17-16...AREA IS EAST OF GORDII DORSUM--GOOGLE MARS...SEE IMAGES BELOW..LATITUDE AND LONGITUDE ARE AT THE BOTTOM OF EACH IMAGE. I MADE A DISCOVERIES IN THIS AREA OF MARS 11-21-16. AREA IS SOUTH EAST OF AGANIPPE FOSSA...GOOGLE MARS...SEE IMAGES BELOW....LATITUDE AND LONGITUDE ARE AT THE BOTTOM LEFT OF THE IMAGE. I HAVE SOME MORE DISCOVERIES ON MARS 11-21-16IN THIS AREA. THE AREA IS NORTH OF ARSIA CHASMATA. GOOGLE MARS IS THE SOURCE AND THE LATITUDE AND LONGITUDE IS AT THE BOTTOM OF EVERY IMAGE.